The main armament of the ‘Sovetsky Soyuz’ class battleships was based on a trio of electrically powered MK-1 turrets, each with three 16-in (406-mm) B-37 L/50 guns. These guns could be depressed to -2° and elevated to +45°, had a fixed loading angle of 6° and their rate of fire varied with the time required to re-aim the guns. The rate therefore varied 2.0 to 2.6 rounds per minute depending on the elevation. The turrets could elevate at a rate of 6.2° per second and traverse at 4.55° per second. For reach gun 100 2,443-lb (1108-kg) projectiles were carried. The guns fired these projectiles at a muzzle velocity of 2,723 ft (830 m) per second to a maximum range of 49,870 yards (45600 m). The secondary armament consisted of 12 6-in (152-mm) B-38 L/57 guns mounted in six MK-4 twin turrets. These guns could be elevated in an arc between -5° and +45°, had a fixed loading angle of 8°, and their rate of fire also varied with elevation between 4.8 and 7.5 rounds per minute. Each gun was provided with 170 rounds of ammunition. The guns could be elevated at a rate of 13° per second and the turrets could be traversed at 6° per second. The guns had a maximum range of about 32,810 yards (30000 m), their 121-lb (55-kg) shell being fired at a muzzle velocity of 3,117 ft (950 m) per second. Major anti-aircraft fire was provided by 12 3.94-in (100-mm) B-34 L/56 dual-purpose guns in six twin MZ-14 turrets with 400 rounds per gun. As their construction began, the ships had only four turrets, but two additional turrets were restored to the quarterdeck in January 1941. The guns could be elevated to a maximum of +85° and possessed a maximum depression angle of -8°, elevation being achieved at a rate of 10° per second and the turrets traversing at a rate of 12° per second. The 3.94-in (100-mm) guns fired a 34-lb (15.6-kg) HE shells at a muzzle velocity of 2,936 ft (895 m) per second for a maximum range of 24,320 yards (22240 m) against surface targets, but their maximum range against air targets was 32,465 ft (9895 m) as dictated by the limit of their time fuse. Minor anti-aircraft defence was the responsibility of 10 46-K mounts each carrying four 37-mm water-cooled 70-K guns with 1,800 rounds per gun. Only eight mounts were planned when construction of the ships began, but two more mounted were added, probably in January 1941, one on each side of the forward superstructure. Each mount was fully enclosed to protect the crew from the muzzle blast of the larger guns and against splinters. The 70-K gun fired a 1.61-lb (0.732-kg) projectile at a muzzle velocity of 2,887 ft (880 m) per second, and its effective anti-aircraft range was 13,125 ft (4000 m). Each main turret had a 39.3-ft (12-m) DM-12 rangefinder for use in local control, but the main armament was generally controlled by one of three KDP-8 fire-control directors. These each possessed had two 26.25-ft (8.0-m) stereoscopic rangefinders, one to track the target and the other to range the splashes of the ship’s own shells. Two of these directors were protected by 20 mm (0.79 in) of armour and were mounted above the rear superstructure and the tower mast, and the other on top of the conning tower, where it was protected by 50 mm (2 in) of armour. Four KDP-4t-II directors, each with two 13.1-ft (4.0-m) rangefinders, controlled the secondary armament: one pair was on either side of the tower mast and the other pair was located on each side of the after funnel. Three SPN-300 stabilised directors, each with a 13.1-ft (4.0-m) rangefinder, controlled the heavy anti-aircraft guns: there was one on each side of the forward funnel while the other was mounted above the rear superstructure. As noted before, Soviet industry could not produce plates of cemented armour thicker than 230 mm (9.1 in), and this forced the November 1940 decision to replace cemented plates thicker than 200 mm (7.9 in) with less effective face-hardened plates. The factories tended to compensate by making the thicker plates harder, but this often made them more brittle and large numbers failed to pass acceptance tests. This would have significantly reduced the level of protection enjoyed by the ‘Sovetsky Soyuz’ class ships in combat. 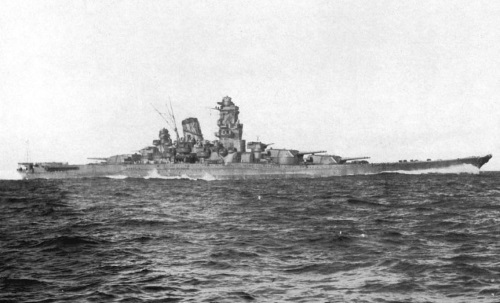 The ‘Sovetsky Soyuz’ class ships had 22,938 tons of armour protection, a slightly greater weight than that of the larger Japanese ‘Yamato’ class, which had 22,895 tons). The armour of the Soviet ships was designed to provide protection against 16-in (406-mm) shells and 1,102-lb (500-kg) bombs, specifically shells fired from forward bearings between 35° and 50° off the centreline. This led to the very uncommon situation in which the armour belt thickened toward the bow to compensate for the narrowing of the ship near the forward magazines, which had to be offset by the incorporation of thicker armour. The belt was 486 ft 11 in (148.4 m) long and extended over 57% of the total waterline length, and was inclined at 5° to increase its resistance to flat-trajectory shells. Over the machinery spaces, the armour had a thickness of 375 mm (14.8 in) and increased in steps until it was 17 in (420 mm) thick over the forward magazines. It was 15 in (380 mm) thick over the rear magazine. The belt extended forward of the magazines at a thickness of 8.7 in (220 mm) and terminated in a 11.1-in (285-mm) bulkhead inclined at 30°: this bulkhead was reduced to a thickness of 9.8 in (250 mm) at the lower deck, from which it was continued downward to the inner bottom by a 3-in (75-mm) bulkhead. Forward of this, the bulkhead was a 0.79-in (20-mm) splinter belt which extended all the way to the bow. The main belt dropped down to the main deck from the upper deck abreast the aft turret to reduce weight. This downward step was protected by 7.1-in (180-mm) plates. A transverse bulkhead, 14.4 in (365 mm) thick, separated the rear turret and the ship’s sides. The main part of the armoured citadel was closed off by a 9.05-in (230-mm) forward bulkhead and a 7.1-in (180-mm) rear bulkhead, both of homogeneous armour, and 1-in (25-mm) splinter armour covered the upper portion of the citadel. The forecastle deck was 1 in (25 mm) thick and the upper deck 6.1 in (155 mm) thick over the citadel. Below it, the 2-in (50-mm) middle deck served as a splinter deck. The upper deck was 3.9 in (100 mm) thick above the 8.7-in (220-mm) waterline belt extension. The bottom edge of the forward splinter belt met with a 2.6-on (65-mm) arched deck. Another arched deck of the same thickness covered the stern abaft of the rear transverse bulkhead. The main gun turrets had faces 19.5 in (495 mm) thick, with sides and roofs 9.1 in (230 mm) thick. Plates with a thickness of 7.1 in (180 mm) protected the gun ports and 2.4-in (60-mm) bulkheads separated each gun. The turrets sat on barbettes which were 16.7 in (425 mm) thick above the upper deck. The turrets of the secondary armament had 3.9-in (100-mm) faces and 2.6-in (65-mm) sides, and sat on barbettes with a thickness of 3.9 in (100 mm) reducing to 2.6 in (65 mm) on their inboard sides. Some 3.9 in (100 mm) of armour protected the faces, sides and backs of the heavy anti-aircraft turrets, whose roofs and barbettes were also of 3.9-in (100-mm) thickness. The forward conning tower had walls 16.7 in (425 mm) thick, while those of the rear conning tower were only 8.7 in (220 mm) thick. The flag bridge in the tower mast had 3 in (75 mm) of protection. The defensive system against torpedoes was designed to withstand weapons with a warhead filled with 1,653 lb (750 kg) of TNT, and it was intended that the ships should be capable of remaining afloat with any five adjacent compartments flooded or with three torpedo hits and the destruction of the unarmored above-water side. The Pugliese system of voids containing liquid-carrying drums protected 403 ft 7 in (123 m) of the ships’ central section. At the aft end was a multi-bulkhead protection system that extended another 108 ft 3 in (33 m) to the rear. The system’s depth was 26 ft 11 in (8.2 m) amidships reducing to 23 ft 0 in (7.0 m) fore and aft. The outer plating ranged from 11 to 14 mm (0.43 to 0.55 in) in thickness while the inner bottom was 7 mm (0.28 in) thick. The Soviet shipbuilding plan of August 1938 envisaged a total of 15 ‘Projekt 23’ class battleships, and this grandiose scheme was only slightly trimmed to 14 ships in the plan of August 1939. Of these, eight were to be laid down before 1942 and the other six by 1947. 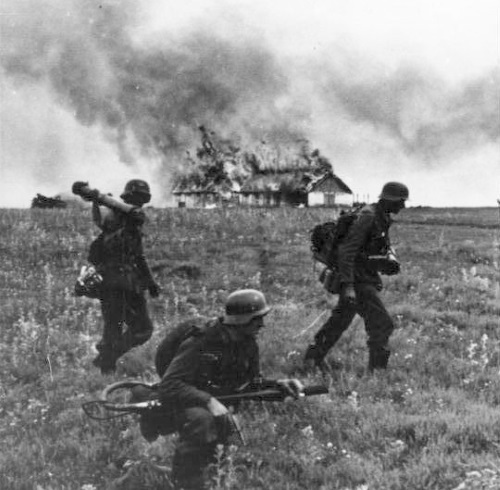 However, only four were actually laid down before the outbreak of World War II persuaded the Soviets to reconsider their scheme. On 19 October 1940 it was ordered that no new battleships were to be laid down so that greater resources would be available for the construction of smaller warships and the strengthening of the army that one ship was to be scrapped, and priority was to be given to only one of the three remaining battleships. The largest warships built in the USSR up to 1938 were the 7,875-ton ‘Kirov’ class cruisers, and even they had suffered from a number of production problems, but the Soviet leadership wilfully ignored the difficulties encountered in the ‘Kirov’ class ships’ construction when ordering 14 much more ambitious ships. Construction of two more ships planned for Leningrad and Nikolayev had to move to the new Shipyard 402 in Molotovsk (now Severodvinsk) because the existing yards could not be expanded to handle so many large ships. Components for these two ships had to be manufactured at Leningrad and shipped via the Baltic Canal and White Sea to Molotovsk. Moreover, the turret-making facility at Nikolaev was inadequately equipped to assemble the 16-in (406-mm) mountings, and the propeller shafts had to be ordered in 1940 from Germany and the Netherlands as Soviet factories were already overburdened. Shipbuilding steel proved to be in short supply in 1940, and a number of batches were rejected because they did not come up to specification. The manufacture of armour plate was still more troublesome as only 1,772 of the planned 9,842 tons were delivered in 1939, and more than half of that was then rejected. Machinery problems were also likely to delay the ships well past their intended delivery dates of 1943/44. Three turbines were delivered to Arkhangelsk by Brown, Boveri in 1939 for Sovetskaya Rossiya, but the Kharkov works had not completed even one turbine before the German invasion of June 1941. A prototype boiler was supposed to have been built ashore for evaluation, but it was not completed until early 1941, which further complicated the production plan. Construction of all three ships was ordered halted on 10 July 1941, and Sovetsky Soyuz was placed into long-term conservation, but this ship, Sovetskaya Ukraina and Sovetskaya Rossiya were stricken on 10 September 1941.